Bob Dutton — actor, teacher, film authority and managing director of the Martha's Vineyard Film Society. 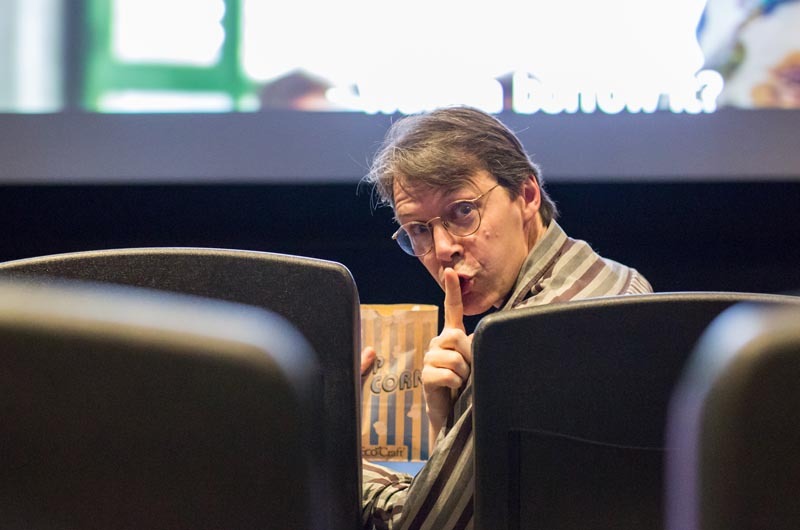 Don’t ask Bob Dutton what he thinks of the latest movie playing at the Martha’s Vineyard Film Center, the Capawock or the Strand. 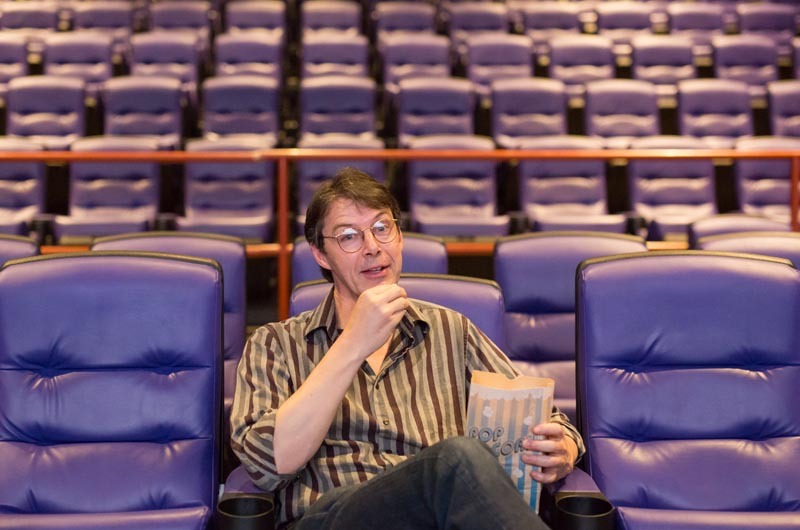 As managing director of all three theatres for the Martha’s Vineyard Film Society, he rarely has a chance to sit down for long enough to take in a full-length feature. Wiry and voluble, with blue-gray eyes behind wide spectacles, Mr. Dutton is a 1979 graduate of the Martha’s Vineyard Regional High School. But while he was already theatre-minded as a teen, he didn’t get to work on a traditional big-finish production his senior year. “We had a very unusual year,” he said. There were no student shows at all, because the high school was closed for asbestos removal and its classes moved to a late shift at the Tisbury School. “Community theatre’s what really got me going,” said Mr. Dutton, who went on to study theatre directing at Emerson College in Boston. To earn a bachelor of fine arts degree, he directed the musical She Loves Me. After college, he managed movie theatres on the Vineyard for several summers and also spent a few months in Los Angeles, working for movie producers, before deciding that Tinseltown was not the place for him. “I realized that the only way to get ahead in Hollywood is to be either exceedingly lucky or exceedingly arrogant, and I did not want a career based on either one of those things,” he said. In 1986 he went into business for himself, opening the Island Entertainment video store — “one of my children,” he called it. In 1991, he sold the business and moved to Florida, where he spent most of the next two and a half decades. In Orlando, Mr. Dutton played multiple roles at the Adventurers Club, a speakeasy-style comedy club at Walt Disney World. It’s a gig he still calls “the best job I ever had,” with fellow-actors of the highest caliber. “We were in character all night,” he said, switching characters during the evening to make a small cast seem exponentially larger. In 1993 he married fellow Vineyarder Molly Conole, a singer, composer and music teacher who appears regularly with the Island Community Chorus. Their wedding, at the Martha’s Vineyard Playhouse in Vineyard Haven, was attended by guests in character costumes — from Superman and Lois Lane to Abe Lincoln and Douglas MacArthur — who paraded down Main street after the ceremony, he said. Ms. Conole also performed at Walt Disney World and the couple resided in Florida except for 1995, when Mr. Dutton returned to the Vineyard as an interim managing director for the playhouse. Back in Florida in 1996, Mr. Dutton became a stay-at-home dad for their two daughters, both now in college, and started a magazine about old television shows called Classic TV Magazine. He also taught drama and English to middle school and high school students and worked as marketing director for a professional dinner theatre in Orlando. Then, “Fate told us to come back to Martha’s Vineyard, for too many reasons to mention,” said Mr. Dutton, whose elderly parents still live on the Island. He filled in as a drama teacher at the high school and performed “all the adult male roles” in the student production of Spring Awakening. But while he maintains his membership in Actors Equity, Mr. Dutton has not stepped on stage as a performer since he was hired in 2014 to manage the three theatres operated by the Martha’s Vineyard Film Society. Instead of acting, he has channeled his creativity in a number of new directions. He is the architect of this weekend’s Spectrum LGBTQ+S Film Festival at the Film Center, proposing the theme and selecting not only most of the films but all the post-screening speakers and special events. He’s writing scripts for a six-hour television series and a musical version of an A.A. Milne play. And beginning Monday night at the film center, Mr. Dutton will teach a six-week class in film analysis that is free to film society members. Meeting at 6:30 p.m. for five consecutive Mondays and Tuesday, May 23, the class is called The Illusion of Truth and promises to be a fast-paced and provocative critical survey of storytelling techniques. The first session is titled The Six Ingredients That Make Up A Story and Mr. Dutton said students can expect to be challenged.